Flavonoids - Are You Ready for a Change? Flavonoids are polyphenols abundantly found in fruits, vegetables, and herbs (eg. tea, ginger root). Flavonoids are synthesized only in plants. They are a diverse group of phytochemicals, exceeding four thousand in number. From a human nutrition perspective, flavonoids are important components of a healthy diet because of their antioxidant activity. Nevertheless, the antioxidant potency and specific effect of flavonoids in promoting human health varies depending on the flavonoid type (chemical, physical, and structural properties). Among the potent antioxidant flavonoid types are quercetin, catechins and xanthohumol. Flavonoid science is a research area rapidly gaining deeper insight on the health benefit and chemical property of flavonoids. Some nuts and certain beans, in addition to being high in protein, are also high in flavonoids. Dark beans such as black and kidney beans tend to be higher in flavonoids from the anthycyanidins group including delphinidin, malvidin, petunidin and kaempferol while beans that are consumed in an immature form such as fava beans or pinto snap beans are rich in flavonols such as epicatechin and epigallocatechin. Walnuts and pecans are high in anthocyanidins while pistachios and cashews are high in the flavonols catechins. The king of all plant proteins is the soybean, which is high in catechins and a particular type of flavonoid, the isoflavone group including genistein and daidzein. Most vegetables contain quantities of flavonoids, particularly green and red vegetables. Members of the nightshade family including peppers, tomatoes and eggplants are high in the flavonols, quercetin and the flavones luteolin. Onions, particularly red onions and green onions, are also high in quercetin. Green vegetables such as celery and artichokes are high in the flavones apigenin and lut eolin, while vegetables such as snap beans, okra and broccoli are high in flavonols including quercetin, kaempferol and myricetin. Tea: Green, white or black tea are a rich source of flavonoids, especially flavonols (catechin, epicatechin, epigallocatechin, epicatechin gallate). Tea is a good source of quecertin. Kombucha is fermented with tea and is loaded with other life changing benefits. Onions: The major flavonoid in onions is quercetin. Other flavonoids in onion are kaempferol and myricertin. Honey: Depending on the flower type the bees feed on, honey contains myricertin, and quercetin. Berries: Many of the berries are high in flavonoids, particularly red, blue and purple berries. Darker and riper berries tend to have higher flavonoid value and processing may reduce levels. Blueberries and cranberries are known to contain quantities of the flavonol group including quercetin and myricetin. Blackberries and black grapes are high in the flavonoids epicatechin and catechin while raspberries, cherries and red grapes may be high in anthocyanidins and cyanidin.The concentration and composition of flavonoids in plants may vary depending on the growing condition, maturity, plant part, and variety. Fruits that grow on trees have been shown to be high in flavonoids. Bananas contain quantities of anthocyanidins including cyanidin and delphinidin. Citrus fruits including grapefruit, lemons, limes and oranges are high in the flavonone group of flavonoids including hesperetin, naringenin and eriodictyol. Members of the Rosaceae family of tree fruits including apples, pears, plums, peaches and apricots are known to be high in catechin and epicatechin and are best if consumed raw with the skin on. Some spices and flavoring agents are particularly high in certain types of flavonoids, and, while generally consumed in smaller quantities, may still offer some health benefits particularly if used while fresh. Dill is known to be high in the flavonols quercetin and isorhamnetin while parsley is high in apigenin along with isorhamnetin. Thyme is high in the flavones luteolin and capers though rarely used are very high in the flavonols kaempferol and quercetin. The best news for some people may be that raw cacao is known to be very high in catechins, particularly if consumed in the dark variety. Carotenes are red and yellow pigments found in all plants. There are more than 600 identified types of carotenes. Common foods with high concentrations of carotenes are leafy greens, carrots, tomatoes, sweet potatoes, yams, squash, grapefruit and apricots. Carotenes are used as a way to prevent cancer. Deficiencies in carotenes have been linked to skin, lung, cervix and gastrointestinal cancers, and to cataracts and macular degeneration. An excess of carotenes in the body can turn the skin orange. Catechins, also called proanthocyanidins, are present in a wide variety of foods. Foods that contain catechins are teas, chocolate, beans, apricots, red raspberries and red wine. Catechins are linked to good feelings, and studies have shown that catechins might help metabolize and reduce body fat. Catechins have also been found to protect the heart and prevent cancer, and to possesses anti-microbial properties. Flavones, flavonols and flavanones are three similar flavonoid types found in a variety of plants. Flavones are found in the highest concentrations in parsley and celery. Flavonol foods include onion, kale, broccoli, lettuce, tomato, apple, grape, berries, tea and red wine. In leafy greens, the greener the leaf, the higher the concentration of flavonols. Flavanones are found predominantly in citrus fruits such as lemon, grapefruit and orange juices. The main source of isoflavones is from soybeans and related products. Isoflavones have been linked to the prevention of breast cancer, prostate cancer, heart disease and osteoporosis. The chemical structure of isoflavones is very similar to that of estrogen. This can cause problems in the body in the production of estrogen, or it can be beneficial by helping to reduce symptoms of menopause. Quercetin is a plant-derived flavonoid commonly taken as a nutritional supplement. Quercetin has been linked to supporting the immune system, clearing excess congestion, supporting bone health, and may aid in fighting mild allergy problems. It is also used in some weight control programs. Quercetin, like other flavonoids, is an antioxidant that travels throughout the body removing harmful free radicals. Studies have also shown that quercetin may also be a potential solution to cardiovascular disease, a leading cause of death in the United States. This idea came from a recent study conducted to study the effects of quercetin on overweight people with high cardiovascular risk. This plant-derived flavonoid was tested on a group of ninety-three overweight and obese subjects ranging from ages twenty-five to sixty-five. Each individual was given only 150mg of quercetin per day, while regular quercetin capsules are weighted at 500mg and can be taken up to three times a day. Over the six-week trial period of taking quercetin in smaller doses, the capsule was found to lower blood pressure and significantly prevent damage to LDL cholesterol. Since only damaged LDL cholesterol causes plaque build up, quercetin was shown to prevent Cardiovascular Disease overall. The results from this study present new-found information about the effectiveness of quercetin. Previous to this groundbreaking study, it was not known if quercetin taken by itself would have any effect on cardiovascular health. Now supplementing with quercetin can be done with confidence, as we now know individual flavonoids such as quercetin are indeed potent. On top of preventing cardiovascular disease, quercetin is capable of saving even more lives in different ways. In 2006, 56,561 people died from hypertension in the United States. With one in three adults suffering from high blood pressure, quercetin could lower the number of deaths occurring due to hypertension. In addition to cardiovascular disease and hypertension, quercetin along with other flavonoids has proven to protect against cancer. Flavonoids are found in fruits and vegetables and have been proven to lower the risk of cancer. Fruits and vegetables alone also contain many anti-cancer properties, including a multitude of antioxidants and other nutrients. Another means of taking in flavonoids is through quercetin supplementation. With supplementation you can get higher doses of quercetin without eating excessive amounts of foods rich in quercetin. In another smaller study, the effects of quercetin were also shown to aid in fighting inflammatory problems such as prostatitis and rheumatoid arthritis. Patients suffering from rheumatoid arthritis are suggested to follow a diet consisting of uncooked fruits and vegetables, seeds, and nuts. Men with prostatitis have also been shown to have more relief from symptoms when taking quercetin than men taking a placebo. Quercetin is a natural alternative to expensive pharmaceuticals that come with a host of side effects. Lycopene belongs to the family of carotenoids. It has a structure that consists of a long chain of conjugated double bonds, with two open end rings. The structure lycopene is the longest of all carotenoids. Lycopene is the red pigment of ripe tomatoes. Tomatoes contribute over 85% of the lycopene intake by women. Lycopene is also found in guava, pink grapefruit, red oranges and watermelon. Lycopene is a very efficient antioxidant, which can neutralize oxygen derived free radicals. The oxidative damage caused by these free radicals has been linked to many degenerative diseases such as cardiovascular diseases, premature aging, cancer and cataracts. In many countries it is legally allowed to advertise foods containing tomato lycopene as "containing antioxidants for the maintenance and support of healthy cells". Lycopene is generally known for its protective action against prostate cancer. In vitro-studies have shown the anti-cancer properties of lycopene against many cancer cells, including cancer cells of prostate, stomach, lung, colon and skin. There are numerous studies about the effect of lycopene on cancer and prostate cancer in particular. More than 80 scientific studies have the names lycopene and prostate in their title. Most of the experiments using cultured prostate cancer cells demonstrate a protective effect. However, most literature review studies or clinical studies are less conclusive and often contradictory. Lycopene also shows anti-mutagenic action against chemically induced DNA damage. Antibacterial and antifungal Lycopene possesses antibacterial and antifungal properties. Lycopene can help to reduce inflammation of the gums and can help to fight infections of Candida albicans. Diabetes patients may suffer from complications as vascular disease, diabetic neuropathies or infections. Lycopene helps to protect diabetes patients against cardiovascular disease and may improve the immune response. However, the consumption of lycopene seems not to reduce the risk of diabetes mellitus type 2. Lycopene has a structure similar to that of the well-known antioxidant beta-carotene, but its antioxidant activity is much stronger. Treatment of cells will lycopene protects cells against DNA damage and lipid peroxidation. Lycopene inhibits platelet aggregation and reduces the production of foam cells which play an important role in the development of arteriosclerosis. Lycopene helps to prevent arteriosclerosis by reducing inflammatory agents in rats increased risk of venous thrombosis. In laboratory conditions, lycopene shows antitoxic properties against many toxins such as aflatoxin, cyclosporine and cadmium. Several researchers have found that organic food contains more of these nutrients than conventionally produced foods. For instance, organic tomatoes contained 79% more flavonoids! Moreover, cooked tomatoes products may contain six times more lycopene than their fresh counterparts. This makes organic pasta sauces a super rich source of these nutrients and they are super easy to use. Beneficial effects of flavonoids on human health are partly explained by their antioxidant activity. 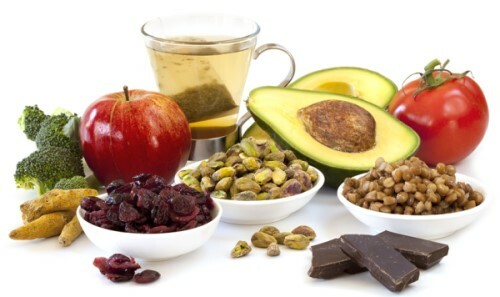 Because of the antioxidative property, it is suggested that flavonoids may delay or prevent the onset of diseases (such as cancer) induced by free radicals. They also inhibit low density lipoprotein (LDL) oxidation by free radicals. Flavonoids have been reported to have negative correlation with incidence of coronary heart disease. Furthermore, flavonoids have anti-bacterial, anti-viral, anti-tumor, anti-inflammatory, antiallergenic, and vasodilatory effect. They also inhibit platelet aggregation.